I couldn't make such a big progress if I had not been trained in Athlete Leadership Programs. 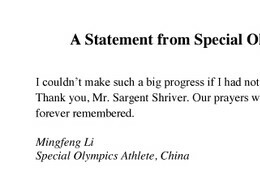 Thank you, Mr. Sargent Shriver. Our prayers will be with you and your families. You will be forever remembered.